4-3-3 or 4-4-2, which formation is best for 2017/18? With the likes of MSN and BBC, it seems the 4-3-3 has been the preferred formation for most teams. However much of last season's success was a result of using the 4-4-2 formation. With most of BBC struggling, I wonder if the formation should be changed. The signing of Ceballos and M. Llorente pretty well leaves Isco out of conventional 3 man midfield. Both he and Asensio are AMs that can effectively play if they use the 4-4-2 formation. ZIdane has declared today that he wants Bale moved if Mbappe is to be signed saying he can only play three of them. That pretty well says he intends to stay with the 4-3-3 formation, leaving Isco and Asensio on bench. 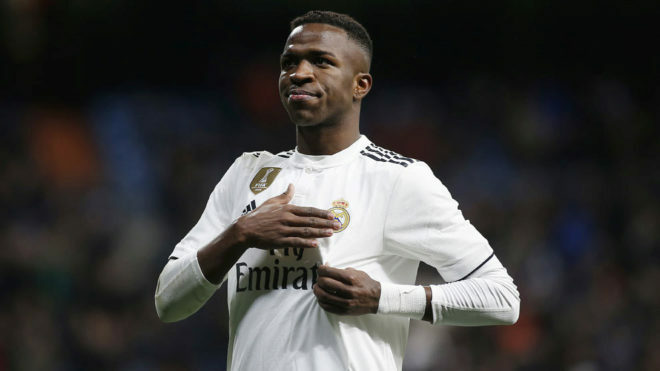 There also are indications that the future front line may well be Ronaldo, Mbappe, Dembele or Vinicius. Again that means staying with the three strikers / scorers formation. My own opinion is that as powerful as three world class strikers looks, it over time is ineffective compared to having that extra mid. The three strikers results in unbalanced defense and a lot of times no link from midfield to front line. Re: 4-3-3 or 4-4-2, which formation is best for 2017/18? 4312 that switches into a 442 when defensive. That's what won us the cl. Would like to stick with it. Firm opinion we need 4 mids minimum. 433 leaves us too exposed even with casemiro staying back. 433 only works if the front three are dangerous enough to force the opponent to respect us. 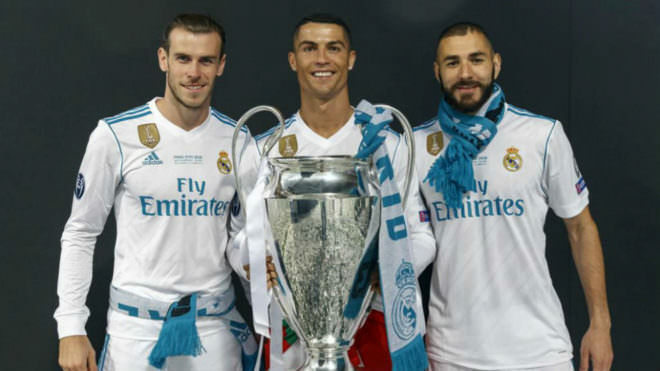 Benz is not what he used to be and Cristiano can no longer beat players like he used to do. Bale is out too often. We can no longer do 433 even if mbappe comes. The path forward is obvious to me. Why is it difficult for you lot? One could argue asensio could do the job but I prefer stability in Midfield. Kroos was never athletic and Modric is getting older. Not just the Frontline, you have to consider the Midfield as well. Though I imagine these Concepts would be lost on y'all. Midfield superiority is key to winning the big games. Let's not mess with it. So let's break it down by line. Defense: Unless ZZ has a stroke or an absolute injury crisis we will continue to play 4 at the back. Unless both Casemiro AND Llorente are out I can't see us playing a high profile match these days with just Modric and Kroos, or any variation of a double pivot for that matter. Zidane was smart enough to realize that a 4-4-2 with Real Madrid's roster and attacking philosophy really turns into a 4-2-4, which is far too unbalanced for 90% of our matches. Attack: To me this is the only slight question mark. We are either going to play a flat 3 (like a traditional 4-3-3) or where Isco has a free role between the 3 midfielders behind him and the 2 strikers ahead of him. In that role Deez, Isco is an AM (midfielder). Similarly so is Asensio although he generally stays to one side (interesting he before last year played almost exclusively on right, but at Madrid was used mostly on left). Maybe it's my terminology but I consider when you have the normal 3 in midfield plus either Isco or Asensio playing with 2 of BBC or Mbappe (2 strikers or scorers) to be 4-4-2. You may not consider it a formation change as essentially it's allowing Isco or Asensio to play and limited BBC plus Mbappe (if he does come) to only 2. I can see if the rumours come true that in future we have Mbappe, Dembele, Vinicius instead of BBC, that maybe 4-3-3 might survive, but for this year (at least), why not use the talent we already have in Isco and Asensio? its quite obvious what formation we will play most of the time. @SuperMAG wrote: its quite obvious what formation we will play most of the time. Ahem, that's 4-4-3! Isn't that illegal? its 4-3-1-2, we won the cl with that last season. Any lineup that keeps isco on the bench is the best IMO who cares about formations you guys surely don't. I care a great deal, clown. Especially as our Frontline is boosted by isco's support in Midfield. Isco is a must and I desire a 4 man midfield. 4312 is ideal for all involved. Turok, while I agree with you (whether you call it 4-3-1-2 or 4-3-3), we should note that Asensio deserves a lot of playing time this year in addition to Isco and that the likely result may be some rotation between Isco and Asensio. Note with addition of Ceballos all three midfield spots are well covered without using Isco nor Asensio for those roles. Much of this depends on if they can move Bale (and sign Mbappe). @futbol_bill wrote: Turok, while I agree with you (whether you call it 4-3-1-2 or 4-3-3), we should note that Asensio deserves a lot of playing time this year in addition to Isco and that the likely result may be some rotation between Isco and Asensio. Note with addition of Ceballos all three midfield spots are well covered without using Isco nor Asensio for those roles. I am very mindful of asensio but he has it very tough. Our glorious Midfield has its cons too. Too many good men and not enough midfield spots. Asensio should compete with isco. Rotation is unavoidable. Competitive Midfield is crazy competitive. I prefer the 4312 as CR7 plays as a striker nowadays. In an ideal world I would go with what cyborg suggested the 4321 but I am not convinced cr7 can play by himself as the lone CF upfront. He has to have a partner to be effective. 4312 gives us an extra mid in the am position which can more easily shift to a 442 in defense vs a 433. 2 strikers upfront at all times will keep the opposition CBs honest. I would like to think we like to control the game at our terms and this is the best way to do it. Having isco played at his natural position with a free role is a boon for him. I like asensio but isco earned his stripes. Though I do agree asensio needs minutes. I do not envy Zidane having to decide this. Some headaches with selection for certain. I dont like the 433. We don't have the wingers and with what we got, we're better off making 4312 the main formation as our midfield is best served with that formation. Marcelo and carvajal are more than enough to bring the width. Midfield is what wins titles so i trust Zidane to make sure we maximize it's potential. I think we can all agree that bale is a waste of time to consider. As far I'm concerned we only got 2 recognized forwards in CR7 and Benz. Yes Benz still has his place on the team. Cr7 can't play alone and until he proves he can, Benz still needed. If we wanted m'bappe we would have brought him in by now. I will assume he's not coming till something changes. Due to recent performances, it seems cyborg had the right idea all along. 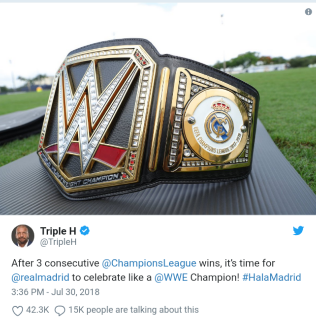 The CIA has brought triumph over the refcelona menace. And Cristiano revealed his complete transition to CF in the biggest rivalry match El clasico. Asensio has proven he is simply far to good to be just left on the bench. More midfielders, more control, more dominance. Isco and asensio is far more dangerous than bail or Benzema for that matter. The way forward is clear. Variables have changed. The CIA is a must and the 4321 should now be considered.